LOGAN — A national pilot shortage is forcing regional airlines into new territory: pilot recruiting. In the last decade, the United States has seen a steady decrease in the number of pilots from 522,112 in 2005 to 467,576 in 2014, according to the Federal Aviation Administration (FAA). But demand for pilots is increasing. Over the next 20 years, the Boeing Co. alone expects the United States to need 95,000 more pilots. In 2008, the aviation industry took a huge hit. Fuel prices skyrocketed. Travelers couldn’t afford to travel. Interest in becoming a pilot plummeted due to the hefty price tag for training and licensing, and the industry lost a lot of personnel and money, the International Air Transport Association reports. Congress passed a bill raising the pilot retirement age from 60 to 65, which meant fewer spots for young pilots hoping to advance to the airlines. Now, those extensions are running out – the Air Line Pilots Association anticipates 21,000 pilots will retire in the next decade – leaving regional airlines scrambling to fill their ground schools and the holes left by pilots jumping to the major airlines. 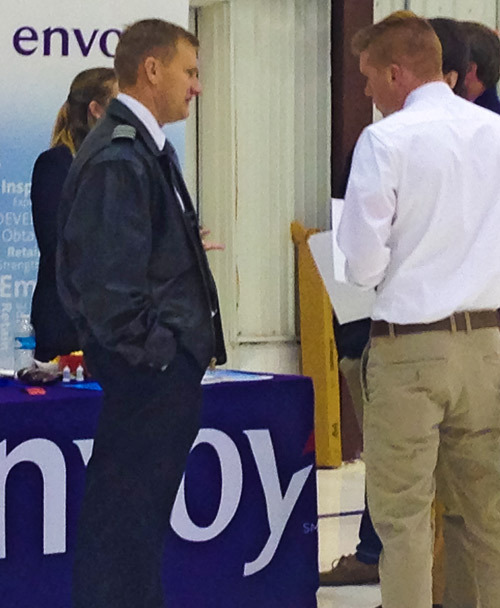 Representatives of eight regional carriers — Envoy, Horizon, SkyWest, Endeavor, Republic, Trans States Airlines, GoJet and Mesa Air — attended USU’s first-ever aviation career fair in November. Dyches sees the fair as a evidence of the regional carriers’ demand for pilots. Envoy recruiter and Embraer 145 First Officer Jessica Hines agrees. Some regional airlines are offering retention bonuses, signing bonuses, guaranteed line pay —meaning pilots are still paid if their flights are grounded due to weather or other hazards — and other salary incentives to attract pilots. Three regional airlines have approached Dyches and asked for 100 pilots each year, but only 50 to 60 pilots are graduating from USU each semester. The cost of an aviation degree is enormous. At USU, aviation students pay $62,093 in flight fees on top of tuition, which means an in-state student must invest nearly $90,000 to earn an average starting salary of $22,400 in their first year as a first officer at a regional airline, according to the Air Line Pilots Association’s 2014 report. Dyches believes if airlines offered options for students to fund their education in the beginning, more students would be interested in becoming pilots. But the career is only getting more expensive as expectations on pilots increase. In 2009, Colgan Air Flight 3407 crashed near Buffalo, New York, after a pilot error, killing everyone on board. Citizens and lawmakers demanded more qualified pilots. The FAA responded two years ago by requiring pilots to obtain an Airline Transport Pilot License, which requires 1,500 flight hours, before commercial airlines can hire them. When Dyches interviewed for a commercial airline job in 2003, he needed only 1,200 hours of flight experience. The new ATP requirement adds an additional 300 flight hours and $10,000 for ground and simulator instruction, and airlines are only just starting to pay the license fees for new hires, he said. The U.S. General Accountability Office reported that fewer students are entering and completing collegiate pilot training programs every year, but USU’s aviation program has been steadily growing. Today, the program has 200 active students, and program administrators are working with airlines to create incentives to attract more students. Three years ago, USU instituted the SkyWest Cadet Program, which allows students to travel to Salt Lake City to train and work with the airline before getting hired. USU also started a pipeline program with Envoy. Students can get hired on as an Envoy employee while still completing their hours as certified flight instructors (CFIs). These employees get travel privileges, full benefits and start retirement funds. USU aviation technology senior Kiano Stoppani, 20, from Port Angeles, Washington, had his final interview with Envoy in Dallas in August and signed a contract later that month. While in Dallas, USU hired Stoppani as a CFI. It was a “big moment” for his career, he said. Now he has a straight path to American Airlines and won’t need another interview, since Envoy feeds the airline, Hines says. Stoppani called this his “safety net,” and another reason he chose this program. Plus, there’s cash. Stoppani has about 400 flight hours logged, and is building the required hours to start training at Envoy while instructing. As an Envoy employee, he doesn’t have to worry about the Affordable Care Act while he instructs. Dyches currently hires CFIs as university employees at 29.5 hours per week, but since he contracts out for Envoy employees, Stoppani can fly as many hours as he wants. In the last three years, USU’s aviation program has had 100 percent placement for graduates, though some have gone to drive trains, fly drones or do survey work. 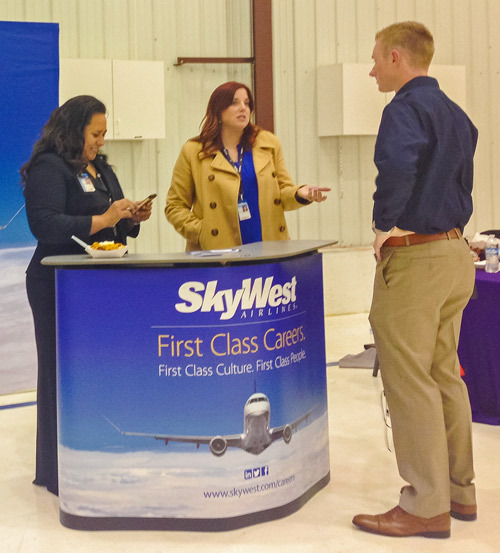 Eighty percent of these students, who aren’t part of the military, go on to SkyWest Airlines, but Dyches thinks that percentage might change as Envoy and other airlines begin investing in students. He thinks the placement rate will continue, as the demand for pilots at regional airlines increases and USU’s program improves.